My YA story about shape-changing robots modeled after the Sigben (Sigbin) of Philippine myth has been translated into Chinese. The original appeared in the book Science Fiction: Filipino Fiction for Young Adults (2016, eds. Dean Francis Alfar & Kenneth Yu) from the University of the Philippines Press. The translation appeared last month in China’s Science Fiction World. With a circulation of +300,000 and 3 to 5 readers per copy, Wikipedia estimates that SF World has a total readership of about one million people — making it the world’s most popular Science Fiction periodical. “Infinite Degrees of Freedom” is my second story in this venue, after 2015’s “Blessed Are The Hungry” (which originally appeared in Apex 62). Sadly, the artist for my story did not use the Sigben visual references I provided. The monster illustrated above looks more like a mutant snubbull from Pokemon Go. 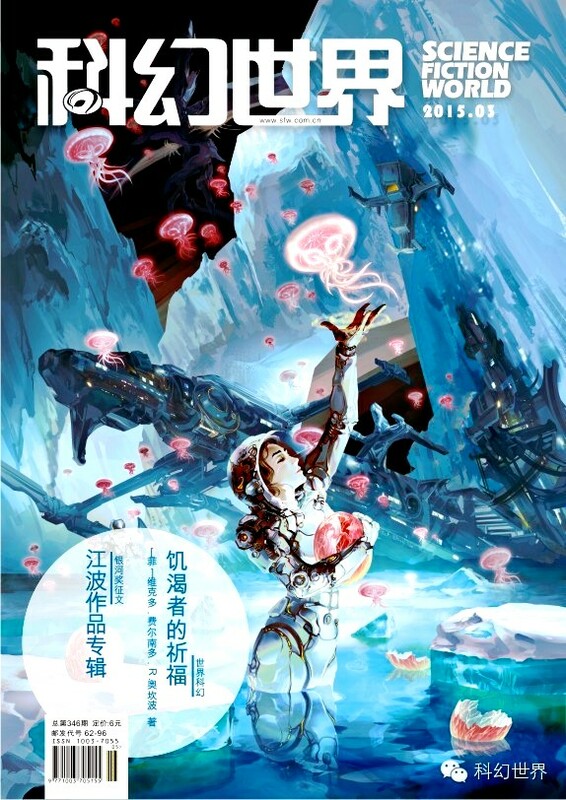 For #ThrowbackThursday, #TBT I am sharing the cover and the first page of Hu Shaoyan’s Chinese translation of “Blessed Are the Hungry” which originally appeared in the March 2015 issue of Science Fiction World. Western readers may find the cover artwork familiar (“Spring Day is Coming” by Liu Junwei) as it also appeared as the cover of Clarkesworld issue 105 later that year. I am so honored to announce that “Blessed Are the Hungry” (which originally appeared in Issue 62 of Apex Magazine) has been translated into Chinese by my friend Hu Shao Yan. It appears on this month’s edition of Science Fiction World! This magazine has a circulation of about 130K subscribers and a readership of close to one million people, I still can’t believe they accepted and published our work. I have been told that this is the first time they have published a story by a Filipino author. For those who still have space on their Hugo ballot this year, please consider my little tale of a Filipino family on a Generation Ship for the Short Story category.